A clean building precedes a spotless reputation. Cleanliness is next to godliness, so says the adage of old. And in parallel comparison, a workplace that is clean and attractive is a boon to all who enter�employees, visitors, vendors and customers. Everyone's health and safety is affected by the maintenance policies embraced by owners of companies, large and small. A lapse in attention by those in charge of building maintenance may result in everything from worker injuries caused by slips and falls to intangibles such as employee grumbling and ill will. Who has not been exasperated when a slap at the soap dispenser triggers nothing but a puff of air? Workplace contamination by viruses, fungus and bacteria on surfaces such as desks, computer keyboards, sinks and countertops can wreak havoc among employees and visitors alike. Reports on the evening news are loaded with dire pronouncements about contagious outbreaks of salmonella, staff infections and other rampaging diseases caused by inadequate attention to cleanliness. Prevention is a priority at many firms. Posters and flyers about the importance of hand-washing are commonplace at many companies. Continuing education is a part of disease prevention. A sparkling reputation and sparkling premises are features of an American company surely headed for solid success. What is the cost of negligence? Illnesses and injuries within a company's personnel pool often lead to missed days of work and overuse of medical benefits�costly blows to company payrolls. Conscientious building maintenance is one way to curb opportunities for the spread of infection or incidence of accidents. A smooth-running operation with a stellar track record of injury-free days and few interruptions to employees' work schedules is attainable. There is janitorial equipment for any building maintenance need. Janitorial supplies and products chosen with some forethought can keep the site in pristine condition�and safe. What products are available for indoor use? Today, the array of janitorial products is amazing. Indoors, cleaning products that contain antibacterial ingredients abound. Heavy-duty dehumidifiers remove dampness and thereby decrease the growth of mold�a major cause of respiratory distress. Vacuum cleaners with large capacity receptacles now sport filters that trap even the smallest particulates. Air purifiers that with infrared light cleanse the building's atmosphere of pollens and airborne germs are finding wide acceptance. What can be done on the company grounds? Outdoors, a supply of slip-resistant runners can be a payoff in safety. There also are many styles of products used at outdoor areas where smokers congregate. The containment products are heat resistant to smoldering cigarettes and feature hefty bases that resist an accidental tip-over. The devices also solve the problem of accumulated stinking butts that litter the ground elsewhere. Weather-resistant benches and durable tables with attached seating can be easily obtained. They make lunch outdoors a tempting alternative to eating at one's desk, where cola and computer keyboards are an evil mix. The theme of safety extends to company parking areas, too. Janitorial supply houses can fill a need for brightly colored parking cones and vividly printed signage. These days, it's not hard to find equipment that even makes an easy task of painting guide lines on asphalt parking lots. Parking lot safety is a big part of overall company safety. 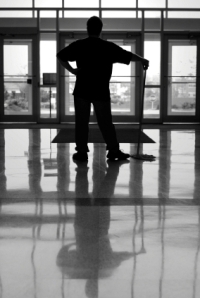 What is the payoff for janitorial awareness? A clean building can result in a high level of employee efficiency and the creation of a good impression when people are visiting there or doing business with those who work there. A clean building can increase the structure's value. Pride and company loyalty increase when folks work in a place that's clean. Visitors and customers notice appearances, too. Who doesn't look around while waiting for an appointment? Who hasn't noticed an ample supply of paper towels in a washroom? Or, cursed the lack thereof? Can little things make any difference? Amenities such as an abundant supply of paper towels, toilet tissue, hand soap and an adequate number of waste baskets�never left unattended until overflowing�are features of an American company whose officers care about their people and their workplace. Open communication and quick responses when complaints are launched also are features of an American company whose employees are its most valuable resource. It's a wonderful and profitable thing: employees coming in early�and leaving late�because their work is also a pleasure.